Is there something you really want to find an answer to as soon as possible? Do not fret. We are here to serve you. Please read some of the popular questions most of our smart customers ask. Here, we have outlined these questions as well as the corresponding answers. Go through them and find succinct answers to your questions and more! Once I purchase a premade book cover will you sell the same book cover to another person? No. All premade book covers on our website are one-time-sales. We never sell a premade book cover to more than one customer. Once you purchase your favourite book cover, we will mark it as sold and the “Order Now” button will not be disabled and removed entirely. Do you update a premade book cover to include my book title, subtitle, etc. of will I pay extra for you to do this? 1. You choose a premade book cover, we edit it and personalize it to your own specifications. 2. It will not cost you anything extra. How long will it take to complete and deliver my book cover? We pride ourselves in the ultra fast delivery of our service. It takes very much less than 24 hours from the placement of an order to the completion. If you request modification, we might apparently have to take a little more time. Do you save my PayPal account or my credit card information? No, We do not save any payment information. We ensure your security with SSL secure connection. Additionally, we use 2Checkout payment method through which you can also use PayPal. Why should I trust the quality of your products? All our products are in the highest quality you can expect. Our products come out in a larger resolution of more than 300dpi. This resolution looks more than sharp in print. Can I possibly get front cover, back cover, spine, and 3D mock up? Yes, you can. However, the possibility depends on the package you pay for. We have three different packages and we make sure that you get more than value for your money. What is the source file format you provide, is the file updatable? What size will the output book cover be for ebook and print? Size of standard eBook covers is 1600x2500. This is provided by us. However, when you print your book, the size of the book cover changes in line with the platform on which you choose to print and your decision. Can I request a high quality book cover sample before making a purchase? Yes, you can wherever necessary. We will provide watermark protected samples to show you the quality of our products but we will not edit it to your specifications and you can not update it. Can you create an illustrated cover design for me? No, we do not create any custom illustration. Can I request any update after an order is completed? Yes, you can. We can modify or update any book cover we sell to you without extra cost within 3 months from the order date. Even then, we will never change the main image or font style of the completed work. You can request to change any other parts. Do you create custom book covers? Yes, we design custom book covers personalized to your taste to satisfy your needs. Can I use a stock image for a custom book cover? Yes, you can select any stock image from Depositphotos. We will purchase the image for you. Can you convert my eBook cover to paperback cover that would include back cover and spine? Yes, we provide revisions to any orders until you are fully satisfied with the design. This will take no extra cost, only extra time. Can I request little changes from a premade cover design, like change in the font color, font style, background color, or to add some new elements to the book cover? Yes, you can. We can make little modifications to the premade book covers you choose. We would however, not change the main image for any reason. Please contact us before you place an order. Can you reserve a cover for me? Yes, we can. even then, you must make full payment if you wish to reserve a cover. Once you make payment, we mark the cover as sold until you are ready with all the specific details to submit and receive your complete order. Can I resell your covers to others? No, you must not. This is against our Terms of Service. Do you have a returns/refund policy? We do not make any refund for all Premade cover designs. Please ensure to check all details before you place an order. 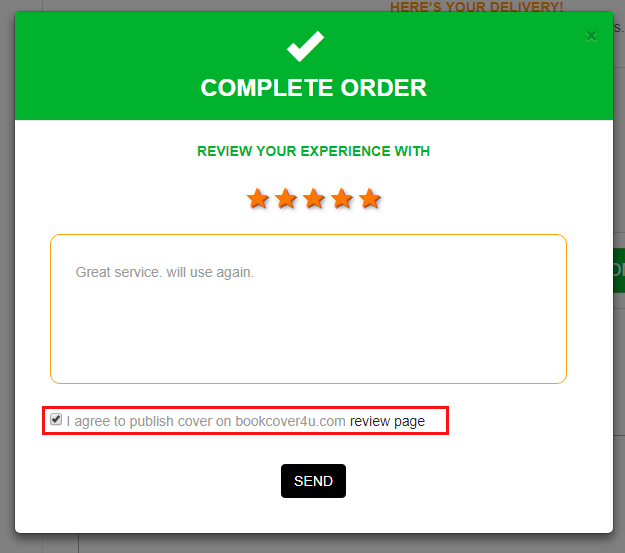 Conversely, for custom book covers, you can request a refund. However, if we purchased a stock image for you, we would not make you a full refund. We will deduct $10. I would like to buy a single book cover design for a series. Can you update the single design to be used for other books in the same series? Yes, we can do book covers for series and each book cover will have a matching design as the first design. We will suggest a number of stock images, you would select one of them and we continue. If I want to give a testimonial (review) for a purchase, will my purchased cover art be published and made public in your testimonials page even before I publish my book? I would I would love to acknowledge you as my favourite cover designer in my book/website. How would you love to appear? We’d be glad to appear on your Bestseller. You can use our brand name “BookCover4u” and you can also make use of our website link in your book, website, or social media platforms. Do you have any more questions not highlighted here? Contact us as soon as possible.